Straumann has released a set of drill stops for use with their single-use implant drills. 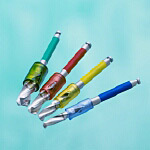 The color coded drill stops come in a kit designed for a specific depth e.g 8mm. The small size of the drill stops offer an optimum view of the treatment area and openings on the drill stops facilitate irrigation and removal of bone chips.